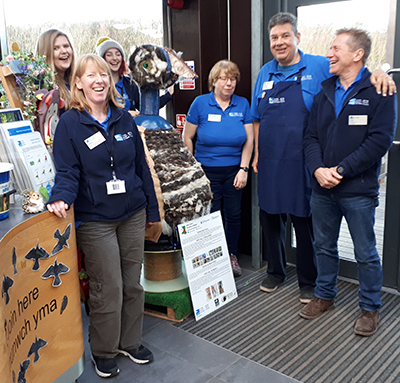 During the Birds of Wales project, bird specialists and exhibiting artists visited primary schools that are near to bird reserves on Anglesey to invite the children to take part in bird-related art and poetry competitions. 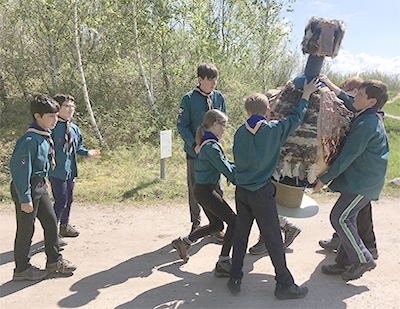 The children were also encouraged to collect feathers which have been added to a sculpture of a ‘Big Bird’ created by Anglesey artist Anwen Roberts. Visitors to the exhibition were asked to name the Big Bird; from the hundreds of entries Anwen chose Griff y Gog (which translates as "Griff of the North") which had been suggested by Meurig Roberts. Throughout 2018, Griff y Gog is ‘flying’ to some of the RSPB reserves across Wales - you can follow his travels on this map. Why not visit Griff y Gog and take a ‘selfie’ with him – tell us which reserve you’re at and share it on our Facebook page @birdsofwalesproject or Twitter feed @birdswalesproj. Griff flew first to RSPB Newport Wetlands where he stayed until the end of March. By early April he had completed the first stage of his migration north, stopping briefly at RSPB Lake Vyrnwy, and then on to RSPB Ynys-hir, where he rested until almost the end of April. He then continued his migration north, arriving at RSPB Conwy on 19 April in plenty of time for The Birds of Wales Art Fair from 5 to 7 May. While he was there, Griff took a tour around the reserve thanks to some local Scouts. He's now completed his migration north, to RSPB South Stack Cliffs where he's built his nest and has settled in for the rest of the year. 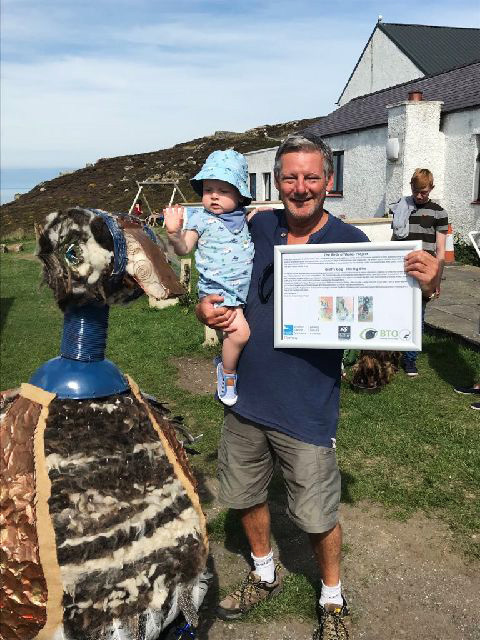 During the summer, Griff met up with Meurig Roberts at RSPB South Stack Cliffs. It was Meurig who had suggested the name "Griff-y-Gog" and is pictured here with Griff and with his grandson, who Griff is named after.